The radar receiver requires a limited tuning range to compensate for transmitter and local oscillator frequency changes because of variations in temperature and loading. Microwave radar receivers usually use automatic frequency control (AFC) for this purpose. AFC circuits are used in situations where you must accurately control the frequency of an oscillator by some external signal. The AFC circuit senses the difference between the actual oscillator frequency and the frequency that is desired and produces a control voltage proportional to the difference. A varicap is used to keep the IF stable. 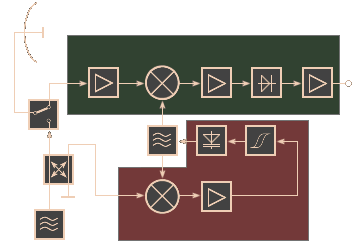 The varicap application here produces an apparent reactance, which is included in the oscillator frequency control circuitry. For example, let's assume the IF is 10,7 megahertz and the local oscillator (LO) is tracking below the incoming frequency. When the LO output decreases slightly in frequency, the IF will rise. 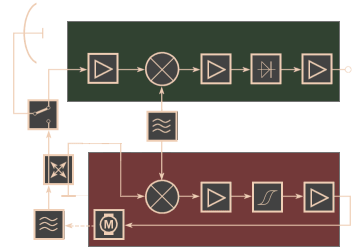 This causes the output of the discriminator to increase the capacitive reactance of the varicap, which increases the oscillator frequency to the desired value. Now let's assume the LO output increases. The IF will then decrease. This causes the discriminator output to decrease the capacitive reactance of the varicap. This will cause the oscillator frequency to decrease. This variant of AFC circuits are used in radio receivers, fm transmitters, and frequency synthesizers to maintain frequency stability. It requires a relatively constant amplitude of the (received) input-signal. For pulse-radar sets this form isn't practicable therefore. Figure 2: Circuit diagram of automatic frequency control for a radar set (case 1). Figure 2: Block diagram of automatic frequency control for a radar set (case 1). Automatic frequency control circuits in a non-coherent or pseudo-coherent radar set uses two different but similar systems. The receivers frequency readjust the transmitter (Figure 3). Both systems retain a sample of the transmitted signal using a Directional Coupler fittet between the transmitter and the Duplexer. This RF-signal will be mixed with the local oscillator frequency to form an AFC-IF-signal. This signal is applied to a frequency-sensitive discriminator that produces an output voltage proportional in amplitude and polarity to any change in AFC-IF frequency. If the IF signal is at the discriminator center frequency, no discriminator output occurs. The center frequency of the discriminator is essentially a reference frequency for the IF signal. The output of the discriminator provides a control voltage to maintain the local oscillator at the correct frequency. The Local Oscillator is adapted to the actual line frequency in this wiring. 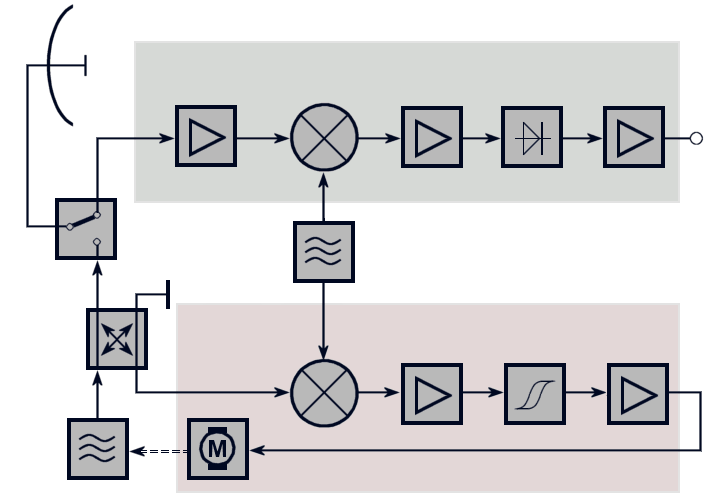 As a second variant the control circuit can control the transmitters frequency instead of the LO frequency! In this case the transmitter-frequency would regulated to the more stable LO-frequency. 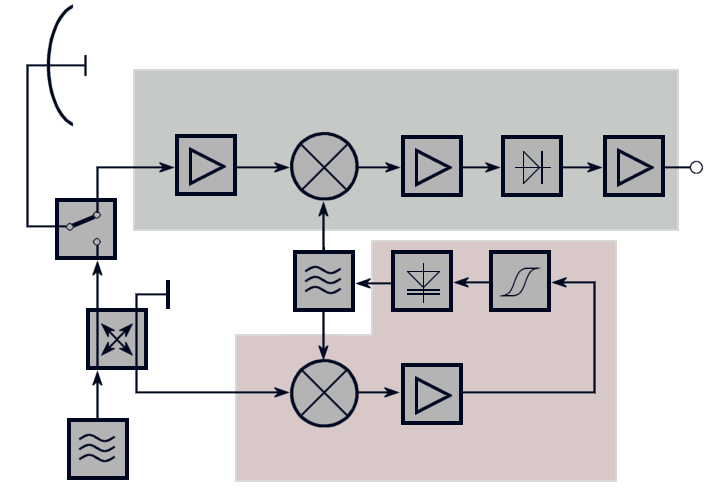 Figure 3: Block diagram of automatic frequency control for a radar set (case 2). Case one is the most used system in older or cheaper radar sets, using a self-oscillating magnetron working at a constructively fixed frequency without any possibility to change the frequency. The second case is used, if the Microwave-tube can be regulated in frequency. This is often made mechanically, while the geometric dimensions of resonance cavities determine the operating frequency of the	Microwave-tube. Fully-coherent radar sets don't need similar stages. The frequencies used in transmitter and receiver are generated by one master timing source, which provides the optimum phase coherence and an exact frequency stability for the whole system.